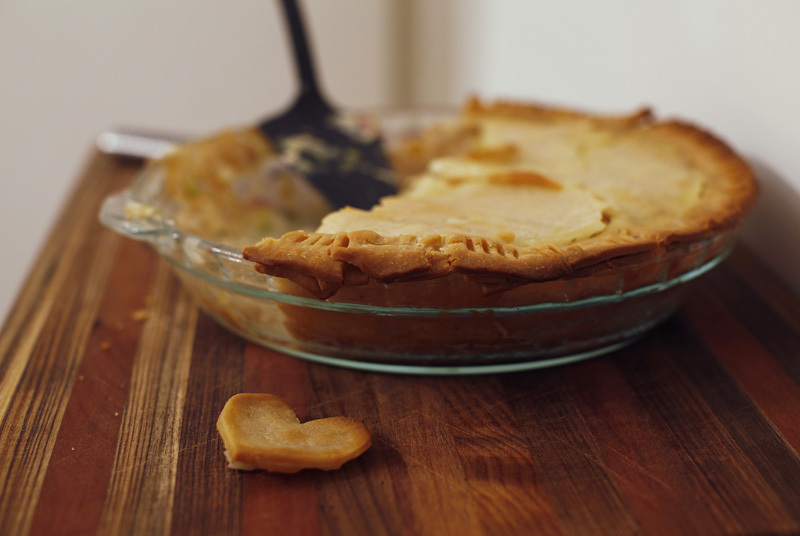 Chicken pie oh how I’ve missed thee…. I’ve missed it because I’ve (incorrectly) put ready rolled gluten free pastry in the ‘too hard to source’ basket. Like gluten free wraps, but that’s another post. Well turns out it wasn’t too hard after all. I decided to make a chicken pie on the weekend, in attempt to get the junior members of my family excited about a dinner that’s not spaghetti bog. I knew the senior member of the family would be excited, as there’s been a distinct lack of pie baking post coeliac diagnosis. I was actually going to just buy regular puff pastry, thinking I would eat something else. But then I saw a bright blue box staring right at me in a shop’s freezer. It was a gluten free puff pastry. Would my troops eat rice flour….and chia? I was sceptical. Sceptical yes, but suddenly I really really wanted to eat chicken pie too. So I bought it. The brand was called The Pastry Pantry. They make ready rolled pastry sheets in their 100% gluten free manufacturing facility. Check out their website – there’s a good list of stockists across Australia (sorry for those not in Oz). My starting point for the pie was a recipe I found on the Gourmet Traveller website, by Andy Harris. I decided to omit the cream, make one big pie and add more secret colour-less vegies. You could add any vegies you liked in. Or anything you like really. 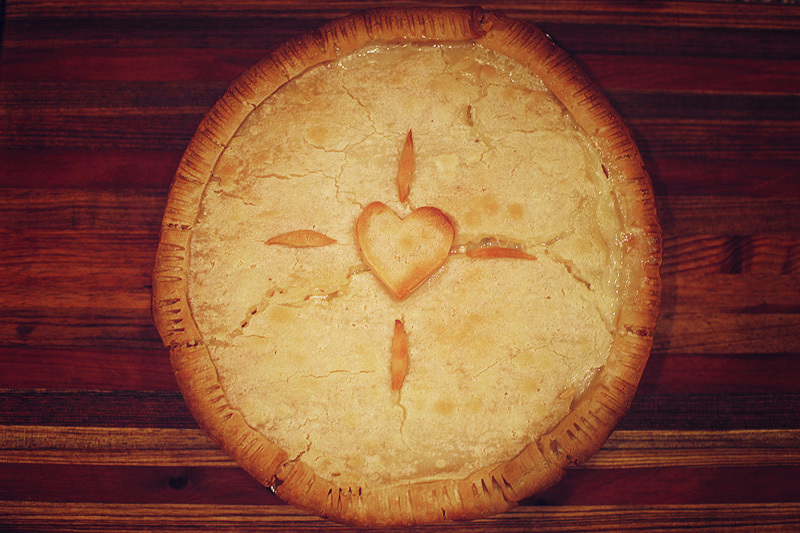 That’s the beauty of a pie. If I was making it just for grownups I would add chopped fresh herbs – thyme, parsley etc. I’ve omitted the 300ml of cream that was in the original recipe – if you want a richer pie then just add it back in. For me this is a weekend dish where I have time, rather than mid-week. If you’re stuck for time you could always try using a store-bought BBQ chook. These quantities below would probably feed around 4-6 adults in one setting, or a whole pile of kids. Leftovers were great the following day. To serve: I did a rocket and finely sliced apple salad – just with olive oil, a squeeze of lemon and S&P. Took 46 seconds to assemble. Or thereabouts. Before you start: crank the oven up to around 190 degrees. Cook the chook: in a bowl, mix about 2 tablespoons of the olive oil together with the thyme sprigs and crushed garlic. Add the chook to the bowl, and mix it all around, seasoning it with salt and pepper. Roast the chook in a medium oven (around 180 degrees) until cooked. Mine took about 40 minutes as they were kinda plumpish. Remove from the oven once cooked and allow to cool. They need to cool down enough to allow you to shred them without burning your fingers. Once they aren’t too hot to handle, shred into small to medium sized pieces into a bowl. Set this aside for a bit. Before you start on the insides: If you’re using a frozen puff pastry like I did, get it out of the freezer to allow it to defrost completely before you start using it. Make the insides: heat 2 tablespoons of the oil in a large saucepan or frypan (needs to have decent sides on it) and cook up the onion, bacon and leeks. Cook for a few minutes, then add in the celery and zucchini. Cook until all the vegies are nice and soft. Then add in the flour, mix it up really well and cook for about a minute or two. 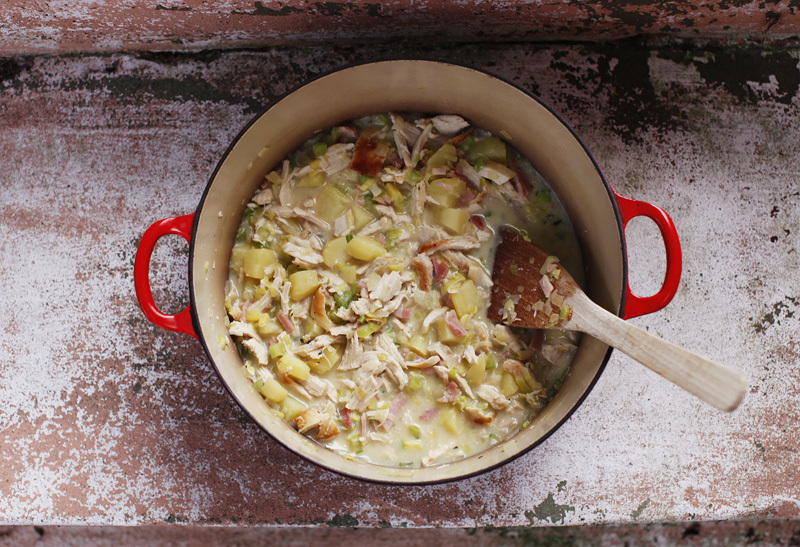 Then very slowly – a bit at a time – add the chicken stock. Once it’s all in, the mixture should start to thicken up. Add in the milk – again really slowly, with continual stirring. You don’t want flour blobs. No siree. Adjust the amount of liquid if required – I ended up adding extra water as the mixture needed it. Depends how oozy or thick you want your filling to be. Once you’ve got the consistency you’re happy with, add in the potatoes and chicken, and continue to simmer. Again adjust liquid levels to suit. Season to taste, then take off the heat and set aside to cool down. Assembling the pie: I’m issuing a disclaimer up front here, to say I’m not a pastry/pie expert. I’m a designer who is quite good with her hands – that’s about my only qualification with working with pastry. So to assemble my pie, I lightly oiled a pie dish. I then cut one big pastry circle to fit the base of the pie dish. I then cut 2 long rectangle pieces and pressed them around the sides. There was a bit of overhang around the top. Next – I gently spooned the innards in. Then it was time for a lid. Another slightly bigger circle – and pressed it’s edges into the side pieces. I then cut some narrow long pieces – about 2 cm in width, and pressed this all around the top – like a raised edge. I used a very small amount of water on my fingers to seal or glue the edges together. Then press a fork into the raised edge – keeps it all nicely together plus is a cool pattern. Decorate the top with some cool shape – I chose a heart. Was thinking of olympic rings but time wasn’t on my side. Brush lightly with olive oil then she’s ready to cook. Cooking time: mine took about 35 minutes to cook and brown up. At the advice on the puff pastry packet, I checked the pie regularly. Like in 10 minute intervals to make sure it wasn’t burning. Take out once it’s golden brown, and serve whenever ready with a simple salad and a nice drop of chardy.